The design features of some four-wheel-drive (4WD) all-terrain-vehicles (ATVs) make it possible for a rider to inadvertently transition from having a fraction of the engine's power and less than half the vehicle's weight on driven wheels to having full power and 100% of the weight on driven wheels. This can cause the machine to lurch backwards violently, and pitch back-over-front onto the operator, with great potential for severe injury. This article describes the characteristics and mechanics of such an accident, reports on testing of an exemplar machine that demonstrated the accident mechanism, and proposes a solution, in the form of a 3-relay circuit. A prototype of the circuit was fabricated and installed on a Polaris ATV with these characteristics. It was demonstrated to function as intended, preventing the chain of events which can lead to disaster, without hindering operation of the all-terrain-vehicle. an override switch that can simultaneously bypass the reverse-speed-limiter and engage the front hubs while the throttle is open. When reverse gear is selected, a reverse-speed-limiter is energized which prevents the engine from operating in excess of a modest preset RPM level. This limiter prevents the vehicle from achieving significant speed in reverse, but also reduces power to the point that the ATV may not be able to negotiate small obstacles. In order to provide additional power in these circumstances, an override button is provided which bypasses the reverse-speed-limiter. The engagement of the front drive hubs are controlled electrically. If the 4WD system is activated and the operator selects reverse gear, the front drive hubs electrically disengage, making the ATV a rear-wheel-drive vehicle. This feature distinguishes the ATVs under discussion here from others on the market, including units which have similar appearing reverse-limiter-override buttons, in that the four-wheel-drive system in other ATVs is not disabled when reverse is selected. Depressing the reverse-speed-limiter override button while in reverse reengages the front drive hubs. The transition from four-wheel-drive (when the operator engages the 4WD system) to two-wheel-drive (when the operator then selects reverse gear) to four-wheel-drive (when they then depress the override button) is unique to the Polaris vehicles under consideration here. The variable-pulley CVT system allows the engine to spin-up quickly when the throttle is opened, regardless of the vehicle speed. It also allows this rapid response to occur smoothly through a wide range of transmission ratios without any manual shifting. If a rider is backing up a hill or obstacle, his weight shifts forward, as does the weight of the machine. The greater the machine’s angle, the greater this effect becomes. While the ATV is only driving the rear wheels, as weight on the rear wheels decreases, the traction available to pull the machine up the hill decreases, making it easier for the rear wheels to spin. Eventually, either the rear wheels begin to spin (traction limited) or the engine simply can’t pull the machine up the hill any further (power limited). Once the engine reaches the maximum RPM level allowed by the reverse-speed-limiter, pressing the thumb throttle further will change the sound of the motor slightly, but will not provide additional power. If the operator depresses the override button while the throttle is open, two things happen: first the reverse-speed-limiter is bypassed which allows the engine to spin-up to whatever level can be accommodated by the position of the throttle; and second the front hubs are engaged and begin powering the front wheels. Thus the vehicle backing up the hill goes from having reverse-speed-limiter limited power and less than half of its weight on driven wheels to having 100% power and 100% of its weight on driven wheels. When the engine’s speed is being limited by the reverse-speed-limiter, an operator does not receive the feedback from the engine which would allow them to accurately assess the position of the thumb-activated throttle. Thus the throttle may inadvertently be pushed to near-wide-open condition. Three batteries of dynamic tests were conducted. In the first, an 80 pound rollcage was fabricated from steel tubing and fitted to the ATV. The weight of the rollcage was well within the manufacturer’s specifications for front and rear cargo rack weight limits and weight distribution, adding 44 pounds to the rear axle load and 36 pounds on the front axle. The rollcage’s center of gravity was located very near the operator’s center of gravity, thus it was not deemed to have a significant effect on the dynamic performance of the rider-machine system. Sitting in the operator’s position, I backed the vehicle up hills of various slopes with the 4WD system engaged. Once the rear tires began to spin (which typically occurred as the front wheels approached the base of the hill), the override button was depressed with the throttle open. Occasionally this resulted in the vehicle lurching backwards up the hill, but on several occasions, this resulted in the machine pitching forward back-over-front. The vehicle came to rest upside-down on several occasions, but when one front tire maintained contact with the ground significantly longer than the other the machine performed a "pirouette," rotating about the grounded tire and came to rest on its side. In the second battery of tests, operator-controlled testing was conducted on the same hills as before. The ATV was backed up to the hills, and the override button was pressed while the throttle was released (closed). This provided four-wheel-drive and full traction from low power levels. It was determined that with moderate throttle application and power being delivered to all four wheels, the ATV was capable of climbing these hills backwards without significant threat of tipping over. The rollcage was removed for the third set of tests. In place of a rider, a 22.5 Kg (50 lb) bag of potatoes was strapped to the seat, and a 9 kg (20 lb) bag of potatoes was strapped into each footwell area. The total center of gravity of the 40.5 kg (90 lb) potato cargo was located below the surface of the seat, and thus created a more stable system than any machine-rider combination. With the 4WD system engaged, the vehicle was backed up a hill of approximately 25 degrees, until the rear wheels began to spin. This was the steepest slope the manufacturer recommended be attempted by an operator. The throttle was held open with a zip-tie around the right grip while the override system was engaged remotely. The results were virtually identical to the earlier tests: on two occasions the vehicle lurched backwards up the hill, while on the third test the vehicle pitched back-over-front. The rear of the machine struck the ground with enough force to bend the rear subframe. Polaris provided warnings in the owner’s manual and in a warning placard on the machine about the potential for "serious injury or death" if one engaged the override button while the throttle was open (Polaris Industries (1), 1995). This indicates that the design’s inherent dangers were known, but that the next (and in this case, simple) step to engineer the potential hazard out of existence was not undertaken. Recognizing that there are generally many engineering solutions to any given problem, the one described here is offered as a possible solution, not as the only solution. By utilizing two Single-Pole-Single-Throw Normally Open (SPST-N/O) relays, and one Single-Pole-Double-Throw (SPDT) relay, in conjunction with the Polaris Electronic Throttle Control (ETC) system, it is possible to prevent the override button from operating until the throttle is first released (closed), after which the throttle works normally. The ETC system on the demonstration unit did not include the added integral switch with which some models were equipped. This made it necessary to modify the tested ETC unit such that it operated as a switch which was open when the throttle was open any amount, but closed (completing an electrical circuit) when the throttle was released. This modification disabled the original ETC function on the test unit, but had no additional affect on the normal operation of the vehicle other than to prevent the override switch from being engaged while the throttle was not fully released (closed). 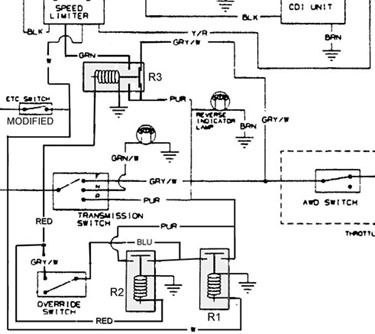 Figure 1 shows the unaltered wiring diagram for the exemplar ATV. The portion of the diagram which was modified to include the three-relay system is indicated by a box. Figure 2 contains an expanded view of the wiring diagram’s modified region, showing the proposed modifications. A working example of this 3-relay system was fabricated from components purchased at a local Radio Shack for about $30 retail. 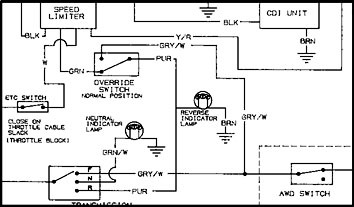 This circuit could be fabricated for much less given the scale of economy available to an original equipment manufacturer. The prototype 3-relay system was installed on the exemplar ATV, and found to work as expected, preventing the reverse-speed-limiter from disengaging while the throttle was open. Showing the modified portion of the exemplar ATV’s wiring diagram. A group of Polaris four-wheel-drive all-terrain-vehicles with specific characteristics was shown to present a hazard which can lead to severe injury or death even for a prudent operator. Warnings for the hazard exist, but the hazard remains on many ATVs on the market and currently in use across the United States. This article presented a description of the circumstances under which an accident can occur, the mechanics of such an accident, and the results of dynamic testing which clearly demonstrated the accident scenario. A simple three-relay circuit was presented which makes the warned-against actions, namely depressing the reverse-speed-limiter override button while the throttle is open, impossible. A prototype system was fabricated and installed on an exemplar ATV. The proposed circuit operated as designed, and did not hinder normal operation of the machine in any way. This 3-relay modification, or its functional equivalent, should be included in the design of all current ATV models which have the above noted characteristics, and should be added to ATVs already in service. Without the assistance of Dan Kagan at Berman & Simmons, PA (207-784-3576) this work would not have been possible. Polaris Industries (1), 1995. 1995 Magnum Owner’s Safety & Maintenance Manual, P/N 9912730 Rev 02, Polaris Industries, Minneapolis Minnesota. Polaris Industries (2), 1995. 1995 Magnum Service Manual, P/N 9912961, Polaris Industries, Minneapolis Minnesota. I recently received an email asking how to tell if a recently purchased used Polaris had this "feature". Here's how: Engage the 4WD by pressing the button pn the handgrip, and noting that the “AWD” light next to the button comes on. Now, engage reverse gear, the light should go OFF. With the throttle released (i.e. the engine at idle still), depress the override button. If the light comes back on, you're machine has this feature. Remember to be very careful how you use the override button, and be sure to always release the throttle before pressing OVERRIDE. This instruction is part of the owner’s manual, but they failed to design the danger out of this one, and the effects are not exactly intuitive. The little wiring diagram above makes it impossible to invoke OVERRIDE until you release the throttle first. Copyright 2002, 2010, Wade Bartlett.